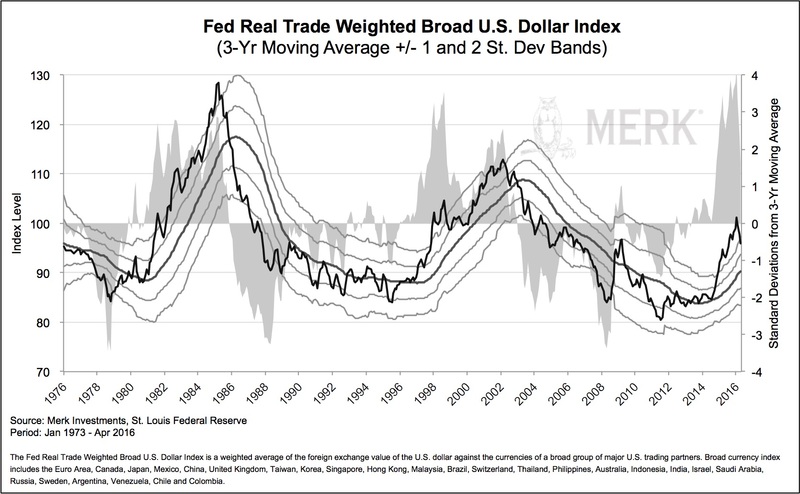 Merk Insights - Precisely Wrong on Dollar, Gold? Precisely Wrong on Dollar, Gold? Since the beginning of the year, the greenback has shown it's not almighty after all; and gold - the barbarous relic as some have called it - may be en vogue again? 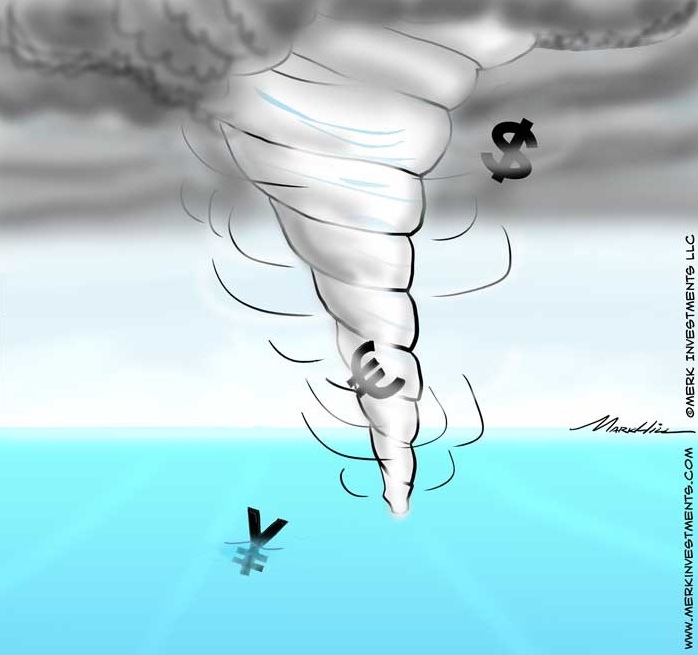 Where are we going from here and what are the implications for investors? Like everything else, the value of currencies and gold is generally driven by supply and demand. A key driver (but not the only driver!) is the expectation of differences in real interest rates. Note the words 'perception' and 'real.' Just like when valuing stocks, expectations of future earnings may be more important than actual earnings; and to draw a parallel to real interest rates, i.e. interest rates net of inflation, one might be able to think of them as GAAP earnings rather than non-GAAP earnings. GAAP refers to 'Generally Accepted Accounting Principles', i.e. those are real-deal; whereas non-GAAP earnings are those management would like you to focus on. Similarly, when it comes to currencies, you might be blind-sided by high nominal interest rates, but when you strip out inflation, the real rate might be far less appealing. It's often said that gold doesn't pay any interest. That's true, of course, but neither does cash. Cash only pays interest if you loan it to someone, even if it's only a loan to your bank through a deposit. Similarly, an investor can earn interest on gold if they lease the gold out to someone. Many investors don't want to lease out their gold because they don't like to accept the counterparty risk. With cash, the government steps in to provide FDIC insurance on small deposits to mitigate such risk. While gold doesn't pay any interest, it's also very difficult to inflate gold away: ramping up production in gold is difficult. Our analysis shows, the current environment has miners consolidating, as incentives to invest in increasing production have been vastly reduced. We draw these parallels to show that the competitor to gold is a real rate of return investors can earn on their cash. For U.S. dollar based investors, the real rate of return versus what is available in the U.S. may be most relevant. When it comes to valuations across currencies, relative real rates play a major role. The short of it is that, based on the measures above, real interest rates are negative. If you then believe inflation might be understated, well, real interest rates may be even more negative. When real interest rates are negative, investing cash in Treasury Bills is an assured way of losing purchasing power; it's also referred to as financial repression. Let's shift gears towards the less precise, but much more important world of expectations. We all know startups that love to issue a press release for every click they receive on their website. Security analysts ought to cut through the noise and focus on what's important. You would think that more mature firms don't need to do this, but the CEOs of even large companies at times seem to feel the urge to run to CNBC's Jim Cramer to put a positive spin on the news affecting their company. When it comes to currencies, central bankers are key to shaping expectations, hence the focus on the "Fed speak" or the latest utterings coming from European Central Bank (ECB) President Draghi or Bank of Japan's (BoJ) Kuroda. One would think that such established institutions don't need to do the equivalent of running to CNBC's Mad Money, but - in our view - recent years have shown quite the opposite. On the one hand, there's the obvious noise: the chatter, say, by a non-voting Federal Open Market Committee (FOMC) member. On the other hand, there are two other important dimensions: one is that such noise is a gauge of internal dissent; the other is that such noise may be used as a guidance tool. In fact, the lack of noise may also be a sign of dissent: we read Fed Vice Chair Fischer's absence from the speaking circuit as serious disagreement with the direction Fed Chair Yellen is taking the Fed in; indeed, we are wondering aloud when Mr. Fischer will announce his early retirement. This begs the question who to listen to, to cut through the noise. The general view of Fed insiders is that the Fed Governors dictate the tone, supported by their staff economists. These are not to be mistaken with the regional Federal Reserve Presidents that may add a lot to the discussion, but are less influential in the actual setting of policy. Zooming in on the Fed Governors, Janet Yellen as Chair is clearly important. If one takes Vice Chair Fischer out of the picture, though, there is currently only one other Ph.D. economist, namely Lael Brainard; the other Governors are lawyers. Lawyers, in our humble opinion, may have strong views on financial regulation, but when it comes to setting interest rates, will likely be charmed by the Chair and fancy presentations of her staff. I single out Lael Brainard, who hasn't received all that much public attention, but has in recent months been an advocate of the Fed's far more cautious (read: dovish) stance. Differently said, we believe that after telling markets last fall how the Fed has to be early in raising rates, Janet Yellen has made a U-turn, a policy shift supported by a close confidant, Brainard, but opposed by Fischer, who is too much of a gentleman to dissent in public. If reality doesn't catch up with the storyline, i.e. if U.S. rates don't "normalize," or if the rest of the world doesn't lower rates much further, we believe odds are high that the U.S. dollar may well have seen its peak. Incidentally, Sweden recently announced it will be reducing its monthly bond purchases (QE); and Draghi indicated rates may not go any lower. While Draghi, like most central bankers, hedges his bets and has since indicated that rates might go lower under certain conditions after all, we believe he has clearly shifted from trying to debase the euro to bolstering the banking system (in our analysis, the latest round of measures in the Eurozone cut the funding cost of banks approximately in half). On a somewhat related note, it was most curious to us how the Fed and ECB looked at what in some ways were similar data, but came to opposite conclusions as it relates to energy prices. The Fed, like most central banks, like to exclude energy prices from their decision process because any changes tend to be 'transitory.' With that they don't mean that they will revert, but that any impact they have on inflation will be a one off event. Say the price of oil drops from $100 to $40 a barrel in a year, but then stays at $40 a barrel. While there's a disinflationary impact the first year, that effect is transitory, as in the second year, inflation indices are no longer influenced by the previous drop. The ECB, in contrast, raised alarm bells, warning about "second round effects." 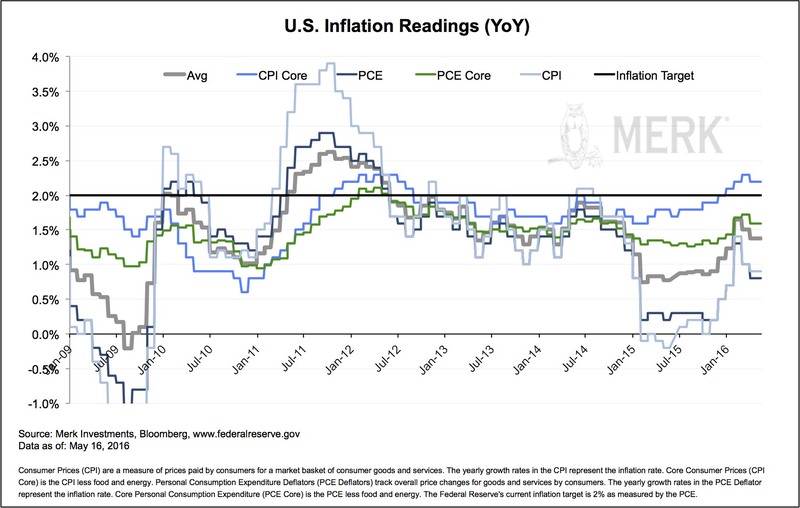 They expressed concern that lower energy prices are a symptom of broader disinflationary pressures that may well lead to deflation. We are often told deflation is bad, but rarely told why. Let's just say that to a government in debt, deflation is bad, as the real value of the debt increases and gets more difficult to manage. If, in contrast, you are a saver, your purchasing power increases with deflation. My take: the interests of a government in debt are not aligned with those of its people. Incidentally, we believe the Fed's and ECB's views on the impact of energy prices is converging: we believe the Fed is more concerned, whereas the ECB less concerned about lower energy prices. This again may reduce the expectations on divergent policies. None of this has stopped Mr. Draghi telling us that US and Eurozone policies are diverging. After all, playing the expectations game comes at little immediate cost, but some potential benefit. The long-term cost, of course, is credibility. That would take us to the Bank of Japan, but that goes beyond the scope of today's analysis. To expand on the discussion, please register for our upcoming Webinar entitled 'What's next for the dollar, currencies & gold' on Tuesday, May 24, to continue the discussion. Also make sure you subscribe to our free Merk Insights, if you haven't already done so, and follow me at twitter.com/AxelMerk. If you believe this analysis might be of value to your friends, please share it with them.